Snipaste is an easy screen capture and image edition program, with the ability to detect windows and menus and supporting pixel-level control. Both captured images and various clipboard content can be pasted as a floating window to the desktop. Windows can be moved, organized into groups, saved to file, as well as basic editions like rotation, zoom, translucence etc. 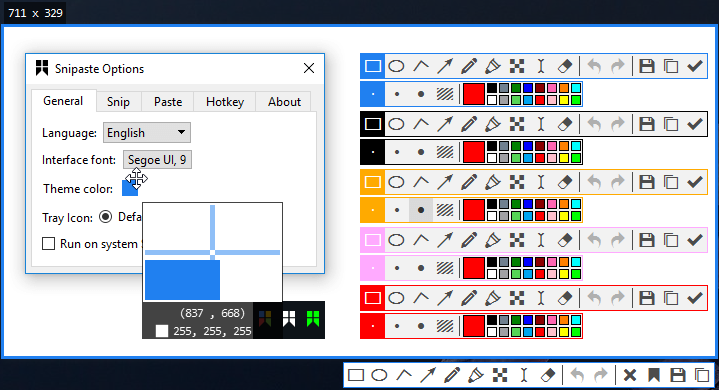 The program can grab colors, supports themes and includes multi-screen support. The default keys (which can be customized) are F1 for Snip and F3 for Paste. How to extract: Download the ZIP package and extract to a folder of your choice. Launch Snipaste.exe. I tried Snipaste for awhile and gave it an honest chance but 4me it doesn't compare to zScreen (I use older version) which I have used for a very long time. I'm really open to finding and using a new or different screen capture pgm. I just haven't found it yet. Not to take anything away from Snipaste cuz in fact it is a good app and easy to use. @Ian: thanks for the notice. Added note to the entry. Version 1.7.3 XP now available on developer's website, resolves XP issues. Developer is very responsive and helpful! Developer advises that VC++ redistributable for VS 2015 is a requirement. XP version of 1.71 fails with a missind DLL message. This is an awesome application. I was using an autohotkey script to perform a "paste to screen" function, but this app takes it to the next step. It's so easy to edit your image with the built-in tools. And paste-to-screen lets you put an screenshot as a floating image so you can reference it - a wonderful tool for developers. I love this. In a very short time frame this became part of my daily workflow. I'm constantly using this to quickly grab some bit of text or some image to easily reference. I run it in concert with ShareX. The developer has added a XP version. XP users- please test the XP version. Thanks for your test, I edited the description accordingly. The 32-bit version of Snipaste 1.3 is 18246572 in bytes while the 64-bit version is 22252668 in bytes.